On July 12, the New York City Department of Environmental Protection (DEP) announced plans for a $1.2 billion tunnelling project that will improve operational flexibility between facilities that are vital to the drinking water supply for more than 9 million people in the City and Westchester County. The public works project will be New York City’s largest water-supply tunnelling effort in Westchester County since the 1940s. Construction on the first elements of the project is expected to start in approximately five years. The centrepiece of the project – known as the Kensico-Eastview Connection (KEC) – will be a 2-mile (3.2km) long tunnel between the Kensico Reservoir and the Catskill-Delaware Ultraviolet Light Disinfection Facility, in Eastview, Westchester County. The new aqueduct will provide additional conveyance between these vital components of the water supply, giving DEP the ability to take other facilities out of service for maintenance and inspection. The KEC project will include construction of the new tunnel, facilities to draw water from Kensico Reservoir and move water into the ultraviolet plant, and other infrastructure work. In 2017, DEP collected soil and bedrock samples from the area to support the design of the project, which has already begun. Construction on the first portions of the KEC project are expected to start in approximately five years; work on the tunnel itself is expected to begin around 2025. DEP expects to finish the project around 2035. The tunnel will stretch approximately 2-miles from an intake chamber on the western side of Kensico Reservoir to a connection point at the ultraviolet disinfection facility. DEP expects the finished tunnel to measure approximately 27ft (8.2m) in diameter and run 400-500ft (120-150m) below ground. The tunnel will be large enough to carry a maximum of 2.6 billion gallons of water each day. Its design accounts for future growth in the City and Westchester County, the potential addition of treatment facilities, and the need to periodically take other aqueducts out of service for maintenance or inspection. The project also includes new facilities and site work at Kensico Reservoir and the ultraviolet treatment plant. A century-old intake chamber at Kensico Reservoir will be upgraded and enlarged to draw water into the new tunnel. The reservoir’s shoreline around that intake chamber will also be improved to prevent sediment from getting into the new tunnel. A new screen chamber to remove debris from the water will be constructed just north of DEP’s main campus at the reservoir, near Columbus Avenue in Valhalla. An interconnection for the Town of Mount Pleasant water supply will also be incorporated into the screen chamber. The chemical feed systems at Kensico Reservoir will be upgraded to provide the proper treatment of drinking water in the new tunnel and existing ones. The work at Kensico Reservoir will also include a range of grading, drainage, stormwater and utility improvements. In addition to the work at Kensico Reservoir, DEP will also build a connection chamber at the ultraviolet plant to receive water from the new tunnel. The chamber will connect to a number of existing pipes at the ultraviolet facility that were installed at the time of its construction. Work at this site will also include a number of projects related to drainage, stormwater and utility improvements. During the next several years, DEP will work toward completing the design of the tunnel and the facilities that will connect it to the reservoir and ultraviolet plant, with Arup having been awarded a design augmentation contract to assist NYCDEP. It will also start the process of environmental review and obtaining permits from federal, state, county, city and local agencies. Although the project is located in Westchester County, its work centres on the delivery and treatment of pristine drinking water that comes from six reservoirs in the Catskill Mountains. Kensico Reservoir was built in 1915 as part of New York City’s Catskill Water Supply System. Kensico was later modified in the 1940s to receive water from the City’s Delaware Water Supply System, also in the Catskills. Those two systems – collectively referred to as the Catskill-Delaware System – comprise the largest unfiltered water supply in the United States. Kensico Reservoir is a vital component of the Catskill-Delaware System. The reservoir stores approximately 30 billion gallons of water at full capacity. 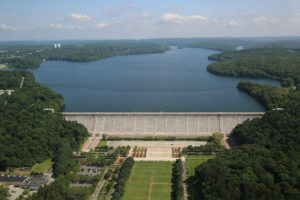 DEP draws about 1 billion gallons of drinking water from Kensico Reservoir each day to meet the demand of 8.6 million people in the five boroughs of New York City and approximately 500,000 residents of Westchester County whose communities are connected to the City’s system at Kensico Reservoir or facilities to the south. As it moves toward the City, drinking water that leaves Kensico Reservoir is treated at the Catskill-Delaware Ultraviolet Light Disinfection Facility, which opened in 2012. The facility in Eastview is the largest ultraviolet treatment plant in the world. The plant provides treatment specifically for Cryptosporidium and Giardia, naturally occurring microorganisms that can be found in surface waters and can cause gastrointestinal ailments in humans. As drinking water passes through the facility it is exposed to UV light that alters the genetic structure of the microorganisms, rendering them unable to reproduce or cause infection. The facility has 56 UV units, each of which contain 210 lamps, for a total of 11,760 UV bulbs. DEP manages New York City’s water supply, providing more than 1 billion gallons of high-quality water each day to more than 9.6 million New Yorkers. This includes more than 70 upstate communities and institutions in Ulster, Orange, Putnam and Westchester counties who consume an average of 110 million total gallons of drinking water daily from New York City’s water supply system. This water comes from the Catskill, Delaware, and Croton watersheds that extend more than 125 miles from the City, and the system comprises 19 reservoirs, three controlled lakes, and numerous tunnels and aqueducts. DEP has nearly 6,000 employees, including almost 1,000 scientists, engineers, surveyors, watershed maintainers and other professionals in the watershed. In addition to its $70 million payroll and $166 million in annual taxes paid in upstate counties, DEP has invested more than $1.7 billion in watershed protection programs – including partnership organizations such as the Catskill Watershed Corporation and the Watershed Agricultural Council – that support sustainable farming practices, environmentally sensitive economic development, and local economic opportunity. In addition, DEP has a robust capital program with $19.4 billion in investments planned over the next decade that will create up to 3,000 construction-related jobs per year.